Home > Resources > Views From the Hill > Midterm Elections: What Do They Mean for Markets? While the outcomes of the elections are uncertain, one thing we can count on is that plenty of opinions and prognostications will be floated in the days to come. In financial circles, this will almost assuredly include any potential for perceived impact on markets. 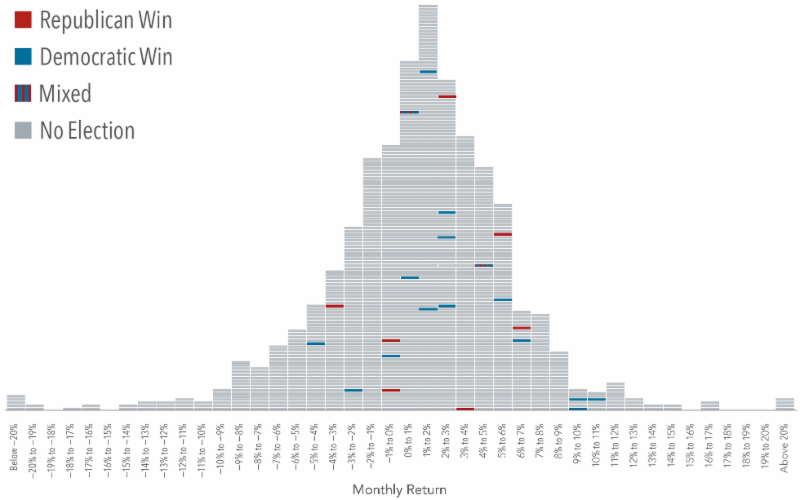 But should long-term investors focus on midterm elections?. Past performance is not a guarantee of future results. Indices are not available for direct investment; therefore, their performance does not reflect the expenses associated with the management of an actual portfolio. S&P data ©2018 S&P Dow Jones Indices LLC, a division of S&P Global. All rights reserved. 1.This is known as the efficient market theory, which postulates that market prices reflect the knowledge and expectations of all investors and that any new development is instantaneously priced into a security.